Mumbai: Modou Sougou pumped in four goals as hosts Mumbai City FC defeated Kerala Blasters 6-1 in a lop-sided Indian Super League game on Sunday. 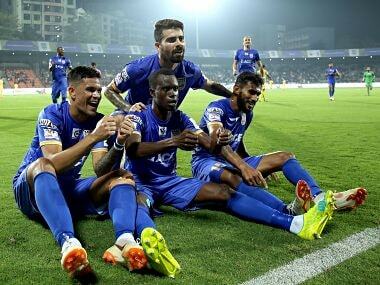 Mumbai City FC players celebrate after a goal against Kerala Blasters FC. Rafael Bastos made it 4-1 in the 70th minute as Mumbai dominated the proceedings right from the beginning. Matias Mirabaje inflicted more agony on the visitors as he scored in the 89th minute, the fifth goal for the home side. Sougou completed Kerala's rout by scoring in the additional time, his fourth and team's sixth goal. The win also meant that Mumbai were able to keep their second spot before going into the break. Mumbai began on an attacking note and it paid dividends as they went 1-0 up with Sougou netting the ball in the 12th minute. Paulo Machado held a long pass on the left flank and delivered a low cross to Sougou in the center and Senegalese slotted it home with ease. And there was no stopping Sougou as he doubled Mumbai's lead in the 15th minute. A defensive error by Kerala custodian Dheeraj Singh helped Raynier Fernandes to take control of the ball. Fernandes found Sougou on his right and Sougou curled it into the top right corner from the edge of the box to make it 2-0. Sougou was on fire as his header off a cross by Subhasish Bose landed into the right top corner of the Kerala goal in the 30th minute. At the half time, the scoreline was 3-1 in Mumbai's favour. After the change of ends, the hosts kept up the pressure by attacking the opposition relentlessly. In the 70th minute, Issoko was fouled by Lalruathara as he cut in from the right, but Bastos got the loose ball. And the Brazilian striker shot it from outside the box into the bottom left corner of the goal to make it 4-1. After this, Matias and Sougou scored as Mumbai's unbeaten run extended to eight games after the win.